Those happy kids are creeping me out. It all started with a neighbor's birthday party...not long after we moved here. One of Jacob's new Cub Scout den-mates invited both Jacob and Timmy to his birthday party. It was a Beyblades tournament. Our sons weren't familiar with Beyblades at the time, I had sent a starter kit as a gift to my college roommate Megan's son for his birthday late last year, but that was direct through Amazon, and none of us were familiar otherwise. After the birthday party, our boys were hooked. 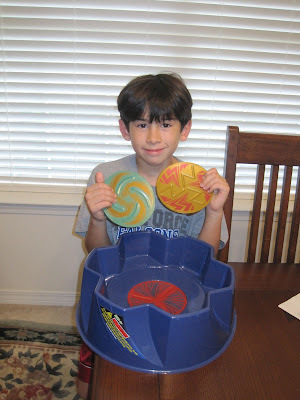 Similar to Cars, Bakugon, Pokemon, etc., each individual toy was inexpensive, but once your kids start learning about all the toys that could be acquired, they began to ask for more and more Beyblades. Six months later, I was watching our boys play Beyblades in one of their stadiums, and they were discussing "balance", "stability" and "agility". It got me thinking about physics. In July on a trip to the planetarium, they boys realized how many of their Beyblades are named after characters in mythology (Pegasus) and astrology (Libra). This led to a blog post for GeekMom. You can read it here. About 6 weeks later, I received an e-mail from a representative at Hasbro, asking if we'd like to "sample" their Fall 2011 Beyblades product line. From what I saw in the e-mail, they were offering us $65 worth of products, free of charge, if we would check it out and I'd write up a follow up for GeekMom. The box arrived in late September, the boys played with it for about 10 days and they (by "they" I mean "Timmy") gave me some very detailed feedback. Here is the follow up blog post reviewing the products. Jacob showing off the interchangeable plates for the "Triple Battle Stadium". Timmy took his newest Beyblades to his after-school child care today (I'm in the midst of hiring a bookkeeper for the base Thrift Shop and we had interviews this afternoon) and the lead provider asked me at pick up time where Timmy got the Tornado Beyblade he had. She said the other little boys who were playing with Timmy were admiring it and planning to ask their parents for one. I had to explain that it came from Hasbro for our review and should be in stores really soon. These Beyblade XTS Tornado battlers should be in stores by now. You CANNOT take these ones apart, which makes them less-authentic, apparently. Wanna know a secret? I came in the Air Force about a year before my husband did. Many of you know this, but many of you don't. 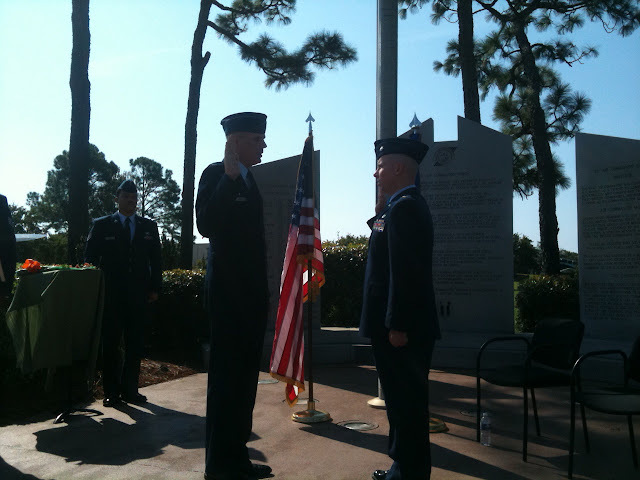 Only 13 months after his notification, last Friday Dave finally got to have his long-awaited pin-on ceremony at the Hurlburt Field Memorial Air Park. A cold front had just come through and even though the temperatures were a bit warm, the humidity was nice and low. The event was held at the base's Memorial Airpark, which as you can see is an outdoor venue. The weather was nearly perfect! The boys were tickled to see their names posted on the chairs. 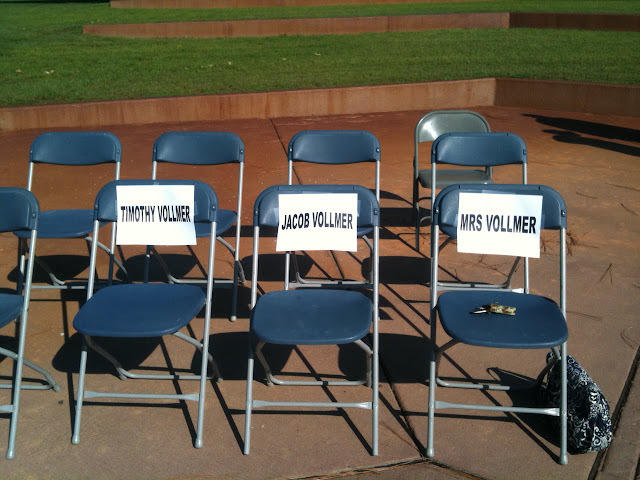 I snuck in a picture during the oath, although I should have just been standing nicely during the ceremony. Dave's commander flew down from Offutt AFB for the occasion. The cake will get a blog post of its own.